Youth camps are great! Especially at night time. And what is the one item that all youth campers should be carrying with them at all times during the night? That’s right, a flashlight! They provide safety and security when walking at night. They are great tools to use in night time games. They make for a fun accessory in flashlight crafts which is our main focus for this article. Since a majority of campers (all if you send out a recommended packing list ahead of time) will have some type of flashlight with them, it is a great idea to use them to make themed flashlight crafts. 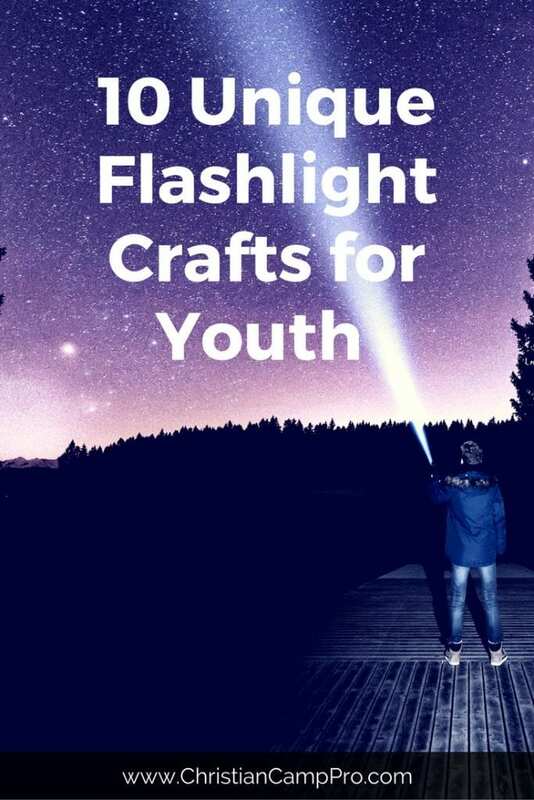 What makes this great is the wide variety of crafts that can be made with the many different types of flashlights your campers will bring. Turn your flashlight into a flaming torch – A straight forward craft where youth use tissue paper and other elements to turn their flashlight beam into a glowing torch that looks like fire. Illuminated Bible Verses – For this craft, you can use translucent paper to make Bible verses that stand out. This is a fantastic way for youth to visually learn memory verses. Any verse is a good verse to use, but consider ones specifically talking about light. Stage Decorations – Letting youth actively take part in decorating the stage help keep them focused during service times. Try letting them create beam patterns to use on the praise and worship stage as well as other areas of the grounds. Color Mixing – Similar to the above, you can also use filters to create different color light beams. This is great when assigning teams or making a point for your message. After all, mixing all the colors with markers makes BLACK, but mixing all the colors with filtered light beams makes WHITE. Shadow Hand Challenge – We’ve all made the barking dog shadow with our hands, but take it up a notch and see which team or individual can make the best shadows. Try to use shadowed outlines to reference things found in the Bible. Shadow Skits – Take it up a notch! Skits are great, but skits using silhouettes are awesome. This can be done on a large or small scale so it is great for all sized groups. Dotted Message – Using black cardboard paper to hide the flashlight beam. Next, use a needle to create dotted letters to form a message to be shown on the wall. Dotted Images – Just like the above. Use paper to block the light beam, and cut out pieces to make a symbol. The great thing about this is that you can use filters to make different colors within your image. Bonus: Use multiple flashlights to create different elements of one larger image. Bigger Flashlights – Using translucent jugs like milk jugs. You can create event bigger orbs of light to use when walking or better yet to serve as boundaries for your next outdoor flashlight games. Lightsabers – For the geek in all of us, use clear fluorescent light bulb covers and color filters to create fun lightsabers. You know that we all secretly dreamed of having one at one point or another. Lastly, it is always a good idea for an adult to supervise and inspect any flashlight prior to using it in a themed flashlight craft for safety reasons.